Happy Summer Solstice! Today began when most of us were still sleeping (at 4.06am, rumour has it) and the air was green and fragrant. Gorgeous. This week I’m pleased to share the news that my poem Dawn Thread has been selected for a special Midsummer issue of Enchanted Conversations: A Fairy Tale Magazine. In case you don’t know, Enchanted Conversations is a beautiful online journal of original fairytales, which has regular calls for submissions. My poem came in a flurry after seeing an exquisite dress embellished by students and tutors at the Royal School of Needlework for designer Nicholas Oakwell (pictured left). 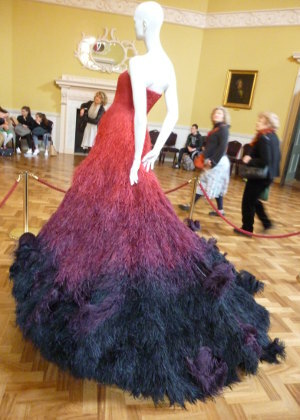 The gown was hand sewn all over with more than 200,000 feathers, dyed in 18 shades of red, and made me think of the kind of tasks traditionally given to maidens in fairytales. The profusion of red made me think of the transition from girl to woman, and the feathers drew to mind several fairytales about long men turned into swans, and their sister sewing them shirts to return them to their human forms. My poetic tale offers a rather different ending, culminating at dawn on the longest day.